Pileus up to 8 cm, convex, flat-convex to almost flat, velvety to smooth or slightly viscid, yellow, yellowish ochraceous, ochraceous light brown, brown, olivaceous brown, orange brown or red, blueing when bruised. 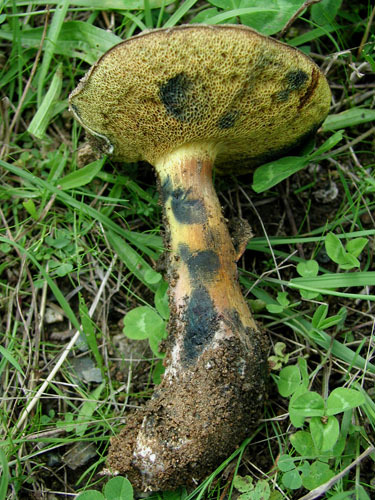 Stipe usually cylindrical, tapering or spindle-shaped, at least in the upper part yellow or yellowish, towards the base greyish, brownish or reddish to vinaceous, strongly blueing and then blackening when bruised. 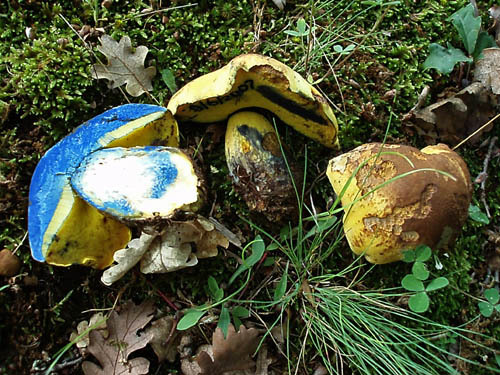 Flesh pale yellow, strongly blueing after exposure to air. Tubes pale yellow to yellow with olivaceous tint, strongly blueing. Pores medium sized, angular, concolorous with the tubes, strongly blueing when bruised. Smell not distinctive. Taste acid. 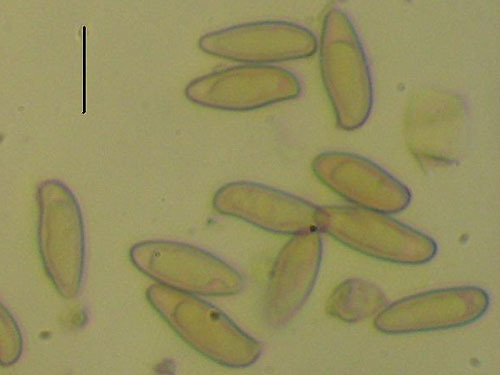 Spores 11–16 × 4–5.5 μm. Pileipellis (the cap cuticle) a palisadoderm, composed of hyphae of cylindrical finely incrusted cells. Chemical reactions: hyphae of the flesh in the stipe base inamyloid with Melzer’s reagent. Habitat. Broadleaf or mixed forests, parkland and gardens, mycorrhizal with oaks (Quercus), beech (Fagus), sweet chestnut (Castanea sativa), lime (Tilia) and probably other broadleaf trees. Note. 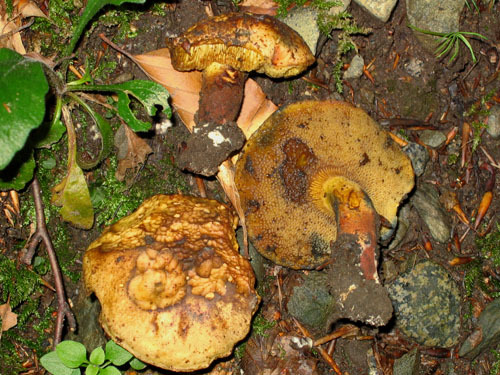 Variable species, but generally recognized by its gracile, xerocomoid stature, medium sized, angular pores, and strongly blueing flesh.